On the upside, it’s a very good performer. On the downside, it makes all networking decisions for you. When I managed to get the OnHub to use channel 149, its performance at close range dropped, and its long-range performance (with the client 65 feet from the router, separated by two insulated interior walls) stayed about the same, but its midrange performance almost tripled. The AirPort Time Capsule, meanwhile, performed slightly better at close range on this channel, and was much faster when the client was further away. The Asus’s performance dropped at close range, was slightly faster with the client at mid-range, and was much faster with the client at distance. Should you buy an OnHub? If you want a router that just works and handles the basics well, with minimal intervention on your part, the OnHub is a good choice. 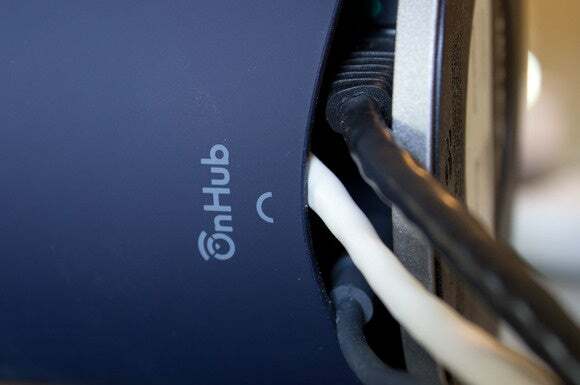 It’s also a good choice for a power user to recommend to the tech-savvy family and friends looking to them for network tech support--the price and performance are good, and the OnHub will make troubleshooting easier. You don’t even need to worry about making sure the router always has the latest firmware—it will automatically download and install it for you. The OnHub’s designers didn’t leave much room for cables to exit the router’s sleeve. 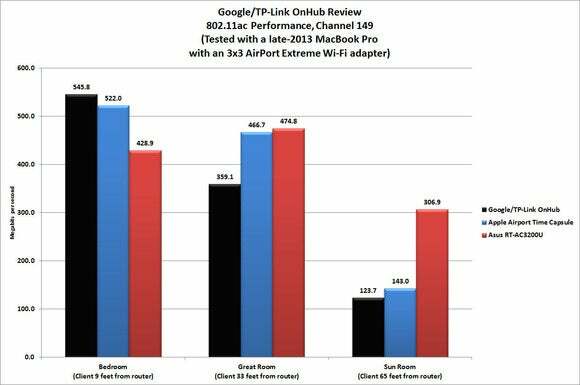 Power users, on the other hand, won’t be as satisfied with the OnHub for their own use. It’s a strong performer, and it has some innovative features—including that TPM module to foil hackers—but its feature set is much too limited: The OnHub won’t let you share storage or a printer over your network; it doesn’t have DLNA, ftp, or VPN servers; and it has just one LAN port. While I appreciate hardware that recommends settings it thinks will deliver the highest performance, I want the freedom to override those recommendations if I don’t agree with them. You can’t control which channels the OnHub operates on, you can’t choose the network your clients join; heck, the OnHub doesn’t even provide for a guest network. Google is currently working with Asus on the design of a second OnHub model. Given Asus’s history of delivering high-performance routers stuffed to the gills with features, here’s hoping that that collaboration yields a router that will be more appealing to power users. This story, "Google OnHub Wi-Fi router review: It's designed to coddle novices and annoy power users " was originally published by TechHive. The OnHub won’t make you trade price for performance, and it’s great for people who don’t want to fiddle with their Wi-Fi networks. Power users, on the other hand, will quickly discover that too many decisions have been decisions made for them—and can’t be changed.